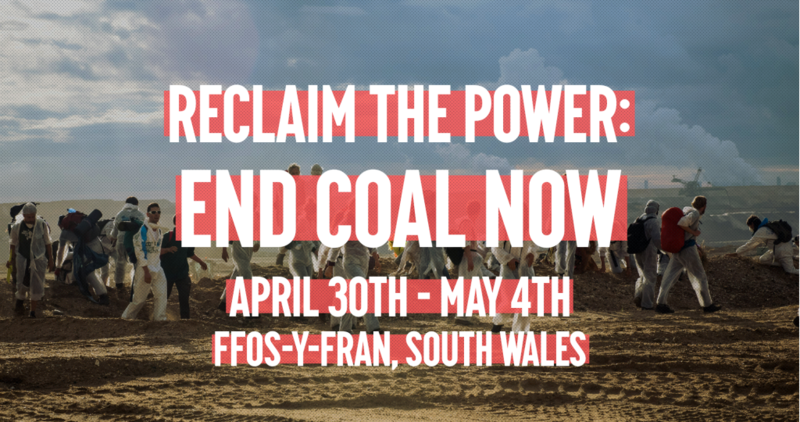 This May bank holiday weekend, Reclaim the Power are going to South Wales to shut down the UK’s largest opencast coal mine, Ffos-y-Fran. With only a few weeks until the End Coal Now mass action camp, Anne from the Coal Action Network came to Birmingham to give us some more information. As a campigner working on local fossil fuel divestment, I was keen to find out more about this strand of climate activism and the wider impacts of coal burning. Anne began by letting us know that the aim of the talk was to highlight the ecological dangers of coal burning and raise awareness of the countless human rights violations currently involved. Anne pointed out that both problems tend to evade public knowledge and understanding. In my case, she was right. I know that coal burning is fundamentally immoral from a climate perspective but I was not fully aware off these additional, harrowing costs. As well as campaigning for an end to opencast coal mining in the UK, the Coal Action Network are calling for the closure of all our coal-fired power stations. These power stations are evidence of what the Coal Action Network call ‘the UK’s coal addiciton’ and are having devastating impacts off shore. As one would guess, the coal burned in our power stations is not always British coal. In fact, most of our coal is imported from Russia and Columbia. It is in these countries that the most horrific human rights violations occur as a direct result of the privatised coal industry. To provide just one example, Anne told us about the Shor Siberian indigneous people, who are being displaced from their native land in the region of Kuzbass as a result of Russian coal corporates. Not only do their houses shake as explosions rip through the mines that were once their sacred mountains, the ecological impacts of coal mining mean there are no fish in their rivers and no cattle able to surive on their land. The coal industry has induced poverty by stripping the Shor people of their means to survive. If that weren’t enough, cases of organised arsen and ransacking occur on a regular basis, literally forcing the Shor Siberian people from their homes. Anne explained that stories like theirs are rarely heard. This ensures that the human impacts of burning foreign coal in the UK lies under the radar. Opencast coal mining happening here in the UK comes with its own set of serious issues including air, light and noise pollution, serious community health impacts, damage to wildlife, destruction of landscapes, increased traffic and dangerous jobs. Despite the closure of three UK coal-fired power stations, increased delays in planning permissions for opencast sites and an overall drop in mining applications, new applications are currently threatening 6 communities in the UK. One of these applications is the focus of the End Coal Now camp. Miller Argent are the corporation responsible for Ffos-y-Fan and would like to further destroy the landscape and local community by digging another opencast mine at Nant Llesg just feet away. After the Government ignored the moritorium on opencast mining that was voted for by the Whelsh Assembly, applications like Miller Argent’s are a violation of democracy as well as a threat to the environment and local community. By highlighting the hidden impacts of coal mining and burning, Anne’s talk reminded me that climate change is central to an incredibly complex web of environmental, ecological, ethical and political problems. With so many challenges to tackle, it is really important to listen to what other campaigners are doing and essential to understand the whole picture. Thanks to Anne for such an informative and inspiring afternoon. CONDEMNED (2014) is a 10 minute documentary on the displacment of the Shor Siberean indigenous people. Find all the information you need to get involved with the End Coal Now camp here.